Increasing military spending to four per cent of GDP would require unprecedented program cuts or huge tax increases. 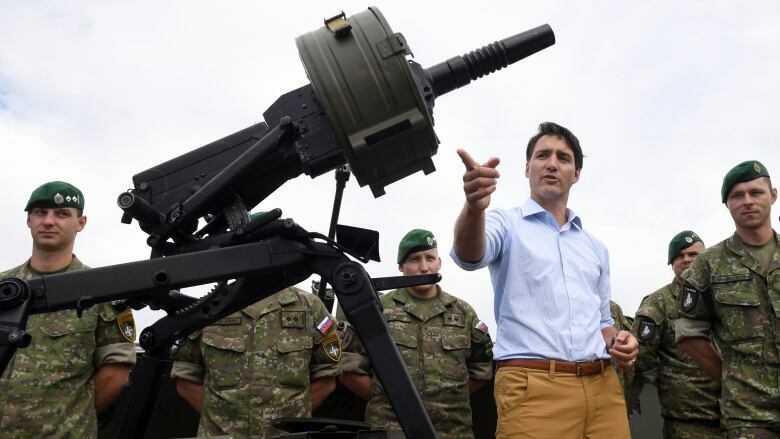 U.S. President Donald Trump is demanding Canada and other NATO allies boost their military spending to four per cent of their gross domestic product. Canada spends about 1.2 per cent. Many politicians and analysts have dismissed the demand as outlandish or impossible. 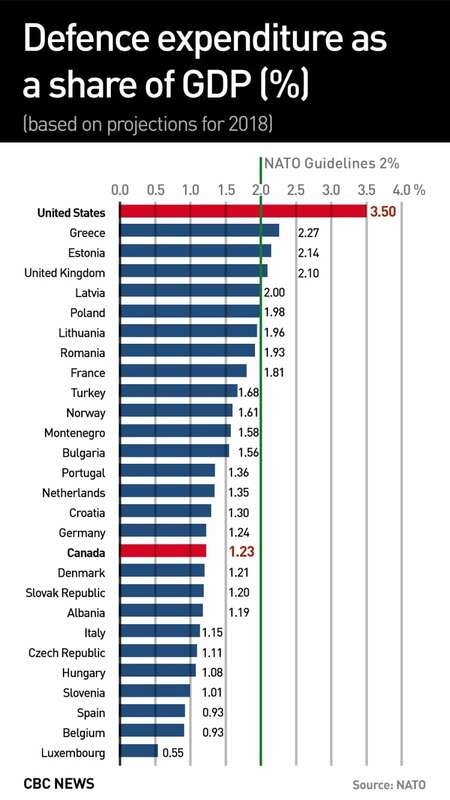 Of course Canada could spend four per cent of its GDP. It's the how that makes it difficult. Start with some basic math. Canada's nominal GDP is $2.1 trillion. Four per cent of that would come in around $84 billion. Right now Canada spends about $25 billion annually on national defence. The Liberals have promised to increase that to $32 billion. But to reach four per cent, we're talking about an increase in military spending of about $60 billion from today's level. So it's all about priorities. 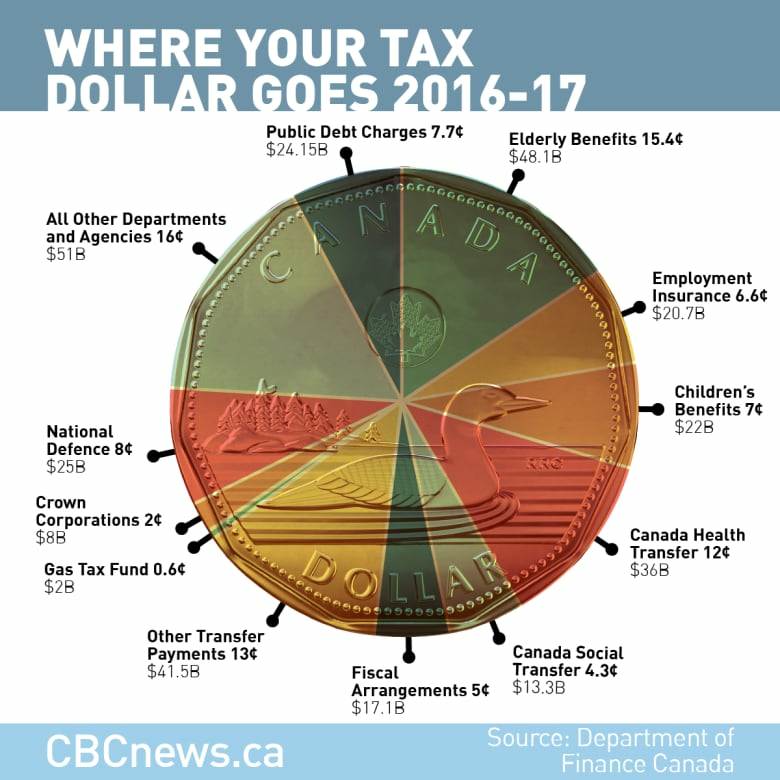 There's only so much money to go around, and most of that pie goes to the social programs most Canadians feel define us. So either cut those programs or dramatically raise taxes. But something's got to give. Consider where your tax dollar goes now. The federal government's biggest single expense is elderly benefits. This includes Old Age Security and the Guaranteed Income Supplement. Last year, these cost $48.1 billion, or 15 cents of every tax dollar. The Canada Health Transfer, the Canada Social Transfer and what the government calls "other" transfer payments together make up about $90 billion or nearly 30 per cent of every tax dollar. To increase spending at all, let alone by as much as Trump is suggesting, you have to cut other spending, increase revenues or run a deficit. You can pick a program and cut it, but finding $84 billion out of that pie is no easy task. "Which part of the pie do you want to want to cut up?" asks Stephen Gordon, economics professor at Laval University in Quebec. "Do you want to pay more taxes? Do you want to spend less?" Then how would you pay for this? Well, Gordon says the straightest path would require a tax hike. Raising an additional $55 to $60 billion would take a pretty hefty hike. Gordon says GST revenues are $37.7 billion for 2018-19, so each percentage point of the five per cent tax is worth about $7.5 billion. "You're looking at a GST of roughly 15 per cent," he says. "We're willing to spend lots of money on public health care and lots of money on old age pensions. If we were willing to spend lots of money on military, we would," says Gordon. "But that would be a political choice." And that's the heart of the matter. In a lot of ways, the public books of any government speak more clearly to intent than any campaign speech or promise following an international meeting. We are what we do, not what we say. Canada spends the vast majority of its money on a social safety net. If we wanted to spend more money on our military, we would probably have done that by now. 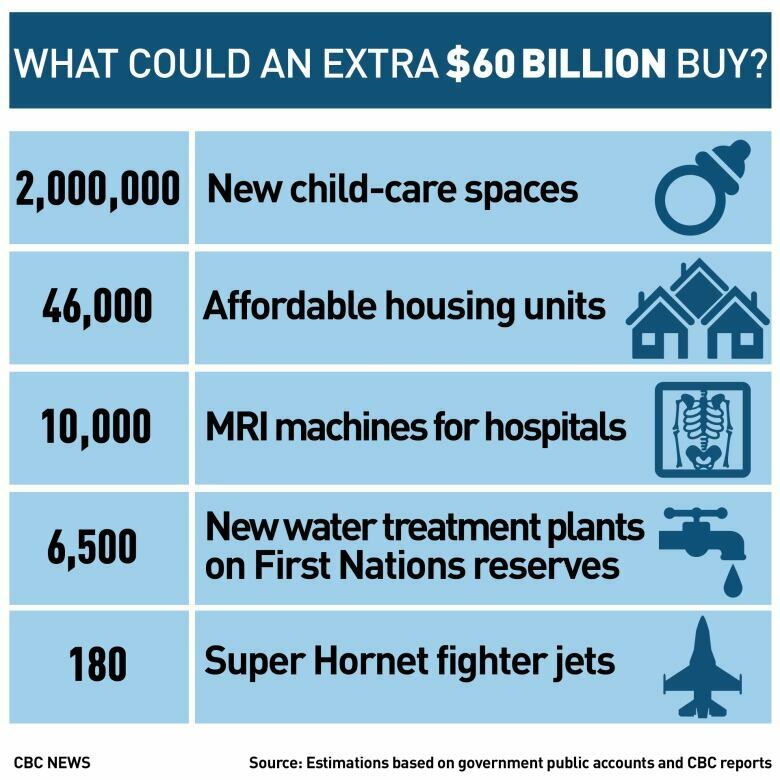 Consider what an additional $60 billion would buy us: 46,000 affordable housing units or 6,500 new water-treatment plants in First Nations communities or 180 Super Hornet fighter jets. It's all about priorities. By the time Trump's two-day visit to NATO wrapped up on Thursday, he was declaring victory, and his allies were seemingly intent on avoiding more confrontation. "They agreed to pay more, and they agreed to pay it more quickly," the U.S. president said at the session's closing news conference. Some disputed Trump's account. But most sought a middle road. Prime Minister Justin Trudeau would only say that Canada is going to follow through on its promise to meet the two per cent target. "To reverse the decline in spending and increase our spending towards two per cent. That's exactly what we are doing," Trudeau told his news conference. Trump's demand may not have been mere politics. The American president is always looking to make a deal. On Thursday he was ready to help NATO countries acquire weapons from the U.S.
"The United States makes by far the best military equipment in the world: the best jets, the best missiles, the best guns, the best everything," said Trump. The U.S. is, after all, the largest exporter of weapons on the planet. A Swedish report last year found the U.S. was responsible for one-third of all arms exports. American arms exports increased more than 20 per cent over the past decade. Trump said on Thursday he was more than willing to make some deals for NATO allies looking to increase their military expenditures via the U.S.
"We are not going to finance it for them but we will make sure that they are able to get payments and various other things so they can buy," he said. ​Many of Trump's more outlandish demands come and go like summer storms. But sometimes they stick or rotate back into the conversation months later. 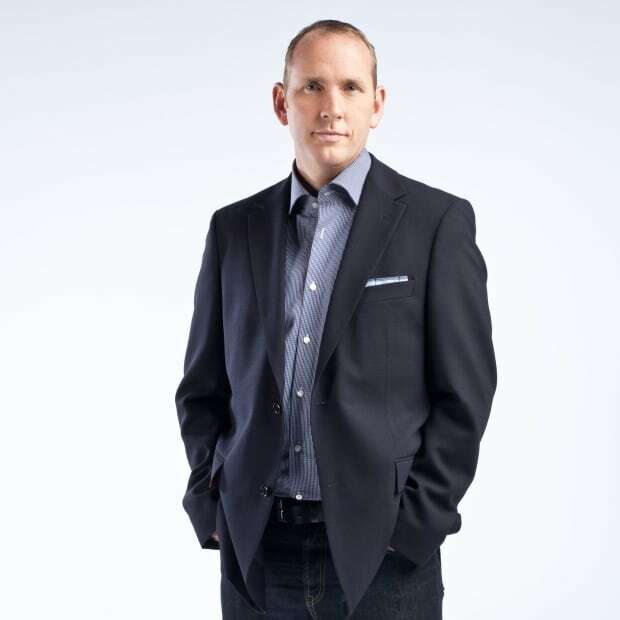 Just in case they do, economist Mike Moffatt of the Ivey Business School at Western University has a novel plan. He says Canada should simply conscript everyone over 65, claim all those elderly benefits as military spending and call it a day.